I decided to pair this tank with the Pioneer4You iPV5, so I'll be taking a look at that device in this review as well. Oh my ^%%*^#^(0&()(*& gawd! So many feels... I am having a real love/hate relationship with this RTA. It actually starts with the name and branding. I live in Arkansas, and Tornadoes are nothing to mess with. Further, the typeface used in the logo is the Disney font. They are calling it an RDTA or Rebuildable Dripping Tank Atomizer, and there is no dripping involved anywhere (except when the tank leaks, but that'll come up later), BUT it does provide vapor and flavor on par with many RDAs. Taking a look at the tank from the top to the bottom, there's a huge, short, conical drip tip sitting on top of a 24 mm diameter tank constructed of stainless steel and glass. It's 58.6 mm tall. Beneath that drip tip, there's a locking collar. The collar rotates and lifts up to expose a huge fill port. Filling this tank is a breeze! Under the collar is the 5 ml capacity glass tank. Inside, there's a massive chimney, and an even larger 17.8 mm build deck. That deck can consist of either a 2 post, 4 hole Velocity style deck (T4), or a 2 post, six hole Horney style deck (T6). The sample I selected has the Velocity deck. Both decks are fitted with direct to 510 24K gold posts. The airflow collar rests beneath the deck, glass and chimney. That airflow collar features two enormous, adjustable cyclops style ports. There's some stylized, cross shaped grips on the sides that make it easy to adjust. The airflow does not click, but it does stop at fully open and fully closed. There is also an optional Gemini/Herakles Plus style top airflow adapter. I did not receive this adapter. What does come in the kit is nice, though. Besides the RTA itself, there is an Allen key, a bunch of spare o-rings, a 510 drip tip adapter, some spare grub screws, and a couple nice twisted wire coils. Sadly, there was no spare glass and no cotton (which I would likely not use anyways, but it's nice to have). That kit can be had for under $30. For what is included, this is a no-brainer. Smokstor.US provided a unit for testing and review, and their prices are quite competitive! The look of the assembled tank is also quite nice, I think. There's minimal branding (the iJoy logo is emblazoned on one side of the fill ring and the word Tornado is scrawled across the side of the atomizer barrel. The grips make me wish I had never seen knurling anywhere outside of the shafts of my old competition darts. It's that nice! 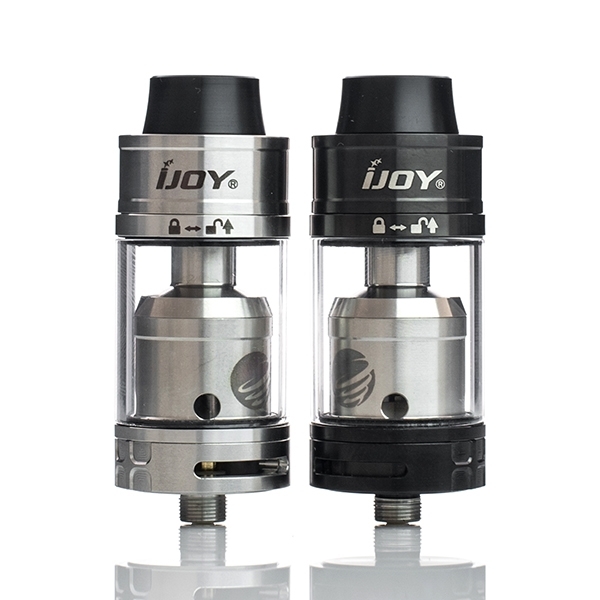 With the top airflow and the T6 deck, iJoy is claiming that this RTA can handle 300 watts! Do I believe it? Not sure. What I do know is that with a quad coil, .2 Ohm build in the T4 deck with the bottom air wide open, I am able to hit 150 Watts and it's barely gets warm unless I chain vape. I have to run the fan on high, or after four or five pulls, I can't see the monitor to write the review. Further, at this wattage, even with that wide open chimney and drip tip, I'm getting no spitting and the flavor is off the charts. Sounds like the perfect cloud chaser RTA, right? Enh... not so fast... There are some significant omissions here. For starters, there's no juice flow control. Top-side filling this tank can lead to a bit of leaking. I experienced no leaking when filling the tank with just primed coils. Once the coils are broken in and the cotton saturated, the e-liquid has a path straight through to the airflow holes. I have not leaked a lot, but I've lost more than a drop when filling a freshly vaped tank. It might be possible to vape the tank a little drier than I have been and avoid that leakage, but I am afraid of the kind of dry hit I'll get off of a beefy set of quads. Building it is another problem. Much like the Sigelei Moonshot, the atomizer barrel bridges the deck and the body completing the circuit. That means while building, the deck is floating. Some have suggested running a spare Allen key through the airflow slots and a hole in the base of the deck, but doing so creates a short and prevents getting a read on the build until finished. I find this unacceptable. Instead of an Allen key, I jammed in a wooden toothpick. No metal, no shorts. That doesn't allow the circuit to complete, though, so there's still no reading the build. It was suggested to me that laying - with some pressure applied - a screwdriver across the base of the deck (avoiding the positive post, of course) and the body would work to complete the circuit. It did, but was not accurate. It was enough, though, to ensure that there were no shorts and to allow me to pulse the coils a bit. With a standard Velocity deck such as the ones inside, well, every RTA that's kit the market in the past couple months, I can tuck in a coil and wick in under 5 minutes. This deck, bobbling about and in need of a screwdriver to test and pulse, took me nearly 30 minutes! It likely would have taken significantly less time if I had chosen to put in a typical dual coil build, but I just had to try the quads. Wicking is just as troublesome. Too much, and there is the risk of a dry hit, which as 150 watts is rough. Too little, and the entire tank of e-liquid will end up on the mod or Ohm reader. I trimmed the cotton (Labo Organic Japanese Cotton) so that it was just touching the deck. I then used a dental pick to ensure that the cotton was not touching the sides of the airflow holes. Again, it was a bit trickier than most builds. The center pin is quite flush. 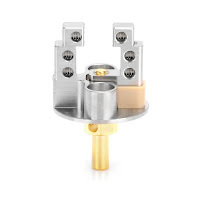 I shouldn't have to say it, but I'm gonna: Don't ever use this on a hybrid top cap device! Ever! In the end, there are significant pros and cons to this tank. Finish - 9/10 - Beautiful tank. I encountered no machine oil (am I just lucky? Or, blind?) Everything fits together nicely. The one point ding was the grub screws... Of the four that were installed in the posts, one was torqued in there quite tight and I had to replace it as soon as I managed to get it out. Form - 9/10 - Again, it's a looker, but the top fill being completely removable bothers me. I would also like to see a slightly longer center pin for safety sake. Final - 9/10 - A grade. Experienced builders with patience only need apply, but for those with the proper qualifications, this is an awe inspiring tank! I bought the iPV5 shortly after buying the Realeaux DNA200. I wanted to see what the SXi_Q software looked like as it appeared that YiHi was touting it as a competitor to eScribe. The top is pleasantly shaped in a rather elongated oval or a rounded off rectangle. 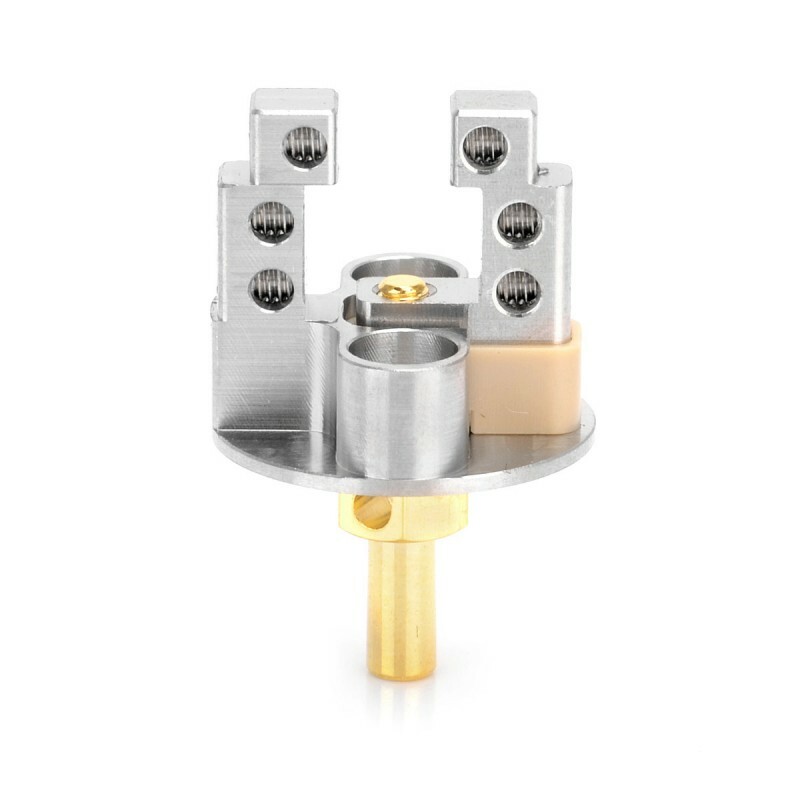 The 510 connector sits off to one side and back in far enough from the bevel that 22mm atomizers look good and have no overhand. The 510 itself is a flat disc with no air channel cuts. If the plan is to use an atomizer that gets its air from the 510, move along... this is not the mod. For all other atomizers, though, this might very well be the mod. The 510 pin is spring loaded (ignore the slotted top of the pin and DO NOT try to adjust) with a VERY long throw. The Tsunami and TFV4 sit very nice and flush. Both sides of the mod are slightly contoured. The contour reminds me a little of the side panels in a '67 Mustang (or other muscle cars of that era). At the top of one side, the company has its logo tastefully stamped into the metal. The other side is devoid of branding. The side panel without the branding can be slid down or lifted to reveal the battery sled. On the spine of the device is another small bit of tasteful branding. 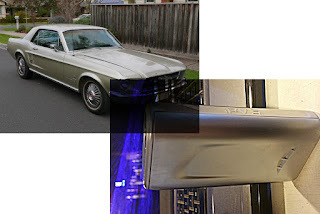 This time, the device's name "iPV5" is stamped into the metal. On the front of the device is the control area. At top, about a half an inch below the beginning of the top's bevel, the metal fire button sets in a shallow scallop between. There is a raised ridge about a quarter inch, then, respectively, the metal adjustment buttons, the deeply inset screen, and the microUSB port are all set in their own little flush, yet separate panel. That microUSB port is there for software interface and firmware updates ONLY. This device has no charger whatsoever. The model I purchased is the brushed stainless version, but it is also available in black, blue, and white (kinda ivory, to be honest). I've seen pictures of a red model, but I've never actually seen the red model. I chose the brushed stainless version because the enamel used in the others felt a bit odd. Just my opinion, but I didn't care for the feel. The stainless, however... well, this is probably one of the most comfortable devices I have ever held. I love the way it feels and fits in my hand. I liked it enough, I went out and bought Stepdot an iPV D3 in the same finish and she concurs... it's a damn nice finish! That aside, it's also a bit slippery and I have dropped my mod once... from about five feet up... onto concrete. The drop destroyed the OBS Crius I had on the device, but left only a tiny scratch at the top front bevel. The finish, then, is beautiful, comfortable, and sturdy! Interesting to note that there are NO externally visible screws. The only screws to be found are on the interior of the device. That space is quite simple, too. The large battery sled is held in place with one screw top center, and two screws at the bottom corners. Beneath that top screw, there is one rectangular magnet, and between the two bottom screws, there are two rectangular magnets. The sled itself takes some cues from the sled design used in the Reuleaux DNA200 in that there are lips on one side. These lips do not prevent reverse polarity placement of the batteries, but can prevent tearing wrappers as they force the user to install the batteries correctly - one end in first, then snapping the other end in place. There is the usual battery ribbon connected. The sled is marked with fairly easy to see positive and negative symbols. This is a big device, though. The measurements are approximately (I have to get new batteries for the calipers, so the measurements aren't quite spot on right now) 120 x 54 x 25 mm. With batteries, it weighs in at 300 grams. In operation, the device is much like any other Pioneer4You device. Five clicks powers the device on, and displays the Pioneer4You logo, then the device name. Once powered on, five clicks enters the menu system. The top button is up and the bottom button is down. Fire locks things into place. That also sets the memory location at the time adjustments began. Pressing up and fire or down and fire appears to do nothing. Pressing up and down sets the resistance - which can be adjusted a bit. Once the menu is entered (five clicks while powered on), there are three top level menu items. Each menu item is reached by pressing the fire button again. Pressing the up or down button will either adjust the value, turn the device off, or exit the menu. The one and only Easter egg that I am aware of involved holding the fire button while installing the batteries. After the batteries are installed and the button released, the device will display the version of the chip and firmware. I was told that the mod would interface with the SXi_Q software, but I've had no luck. Further, there is no manual for the software that I can find. The program has to be used, though, to update the firmware. Updating the firmware requires that the device be disconnected, the batteries removed, the atomizer removed, the software started, THEN the device connected. If any mistakes are made along the way, the entire process has to be repeated. At present, there is only one update available on Pioneer4You's website (which is about as good as the software... which is to say it's not very good at all). I purchased the iPV5 at my local brick and mortar shop (which, coincidentally, is really a brick and mortar shop... no wood). I paid too much, but I'm supporting local businesses and I encourage that kind of behavior. However, if the local shop is asking way way way too much, I have found the device online for around $38 using VapeCrawler. Form - 9/10 - I think it's a very nice looking device. It seems to me that a lot of thought went into the design from the bevel on top allowing for tanks to sit with no overhang to the deeply inset screen that allows the device to be easily viewed in sunlight. I have to take off a point for the size and weight - even though I like these things, it is a beast. Final - 8.7/10 - A solid B. honestly, I feel like it should rank a bit higher IMO, but them's the numbers... If I lost it, I would probably go out and replace it. The e-Liquid used in the video review / vlog was VapeMilk. Get the e-liquid on their website at www.vapemilk.com for the really reasonable price of $22.99 per 120 or in a couple different sample packs ranging from $45 to $115. However, you can use the coupon code “Shawn10” and get 10% off!